The leader's den is a giant gap in a tree's trunk near the back of camp. The medicine cat's den in the same, only nearby the nursery, which is a stone cave-like structure opposite camp from the leader's den. The warrior's den and the apprentice's den are two tunnels that their entrances are a cave-like stone structure like that of the nursery's. The elder's den is a huge dug-in cave on the other side of the medicine cat's den than the nursery. The black cat was sitting on a cleared patch of dirt, his clean black coat shining with health under the suns heat. His head was bowed slightly as he thought to himself, right, need to send out patrols to borders, need to send out hunting patrols, have to check the territory for potential spots we can use if we're ever invaded. So many things to think and prepare for, this deputy business is hard work . The deputy had been recently announced and was still slowly setlting into his new role within the clan, privately amazed that Minkstar had picked him he was determined not to let her or his clan down. He stood from his sitting spot in the sun and paced around a couple of times, his mind trying to think of every possible way to defend and attack from the territory. Loners were getting ever bolder so they needed to be ever vigilant, he had to be ever vigilant, dealing with the other clans was pesky and boring they were all so dull. Minkstar, a pretty white and orange/reddish brown she-cat was sitting on top of a small boulder on the one side of camp, her white and orange/reddish brown tail flicking from side to side. Camp's never been this quiet before! she thought in her head. Her amber-green eyes glancing around camp nervously. Even though she had plenty of experience being a leader, she still was worried about her choices that she made. The she-cat would like to have kits of her own at some point, but her position as Clan leader prevented her from being cooped up in the nursery caring for kits all day. The black cat flicked his ears seeing his leader Minkstar looking anxious. He got up from his spot and slowly padded over to her his orange eyes interested, "Minkstar, you look concerned, is everything alright?" he mewed in his distinctly british tones. He stood beside the fair leader with his tail tip twitching as he thought, perhaps shes worried about the lack of members, we are weak right now, perhaps I should go and collect some potential loners to join us he thought to himself, genuinely concerned for his leader and the clan. He was fond of Minkstar, he often worried about her as well. Minkstar's greenish amber gaze glanced at her deputy, sorrow clouded over her eyes. The look of her eyes then quickly disappeared and she smiled faintly. "Oh! It's nothing! It's just...........how am I supposed to lead my clan when I barely have a clan to lead?" she asked him, glancing across camp, her gaze flickering with deep worry. Frost, a white grey striped she-cat with blazing blood red eyes, padded into a small river. Clumps and specks of dirt covered her snowy pelt, turning it into a dim shade of brown. The cool water rushed through her fur, sweeping away the dirt in musky clouds. She let out a relating sigh and sat down in the shallows. Hopefully Pyro and Cloud aren't looking for me. I crossed into marked territory, so they shouldn't follow. But I should get out of here before I'm caught. She shrunk down a bit, the water to her neck. This is going to take longer than expected. Minkstar sighed deeply before she stood up and jumped down off of the small boulder. "I'm gonna go hunt." she mewed to her deputy before she padded out of camp. She then reached the small stream and noticed a cat swimming in the water. A loner maybe? she asked herself in her mind. She padded up to the water's edge, her tail twitching side to side. "Hey, you! What are you doing?" she asked the unknown cat. Frost jumped out of the stream in panic. The chilled wind blasted against her fur, sending shivers through her spine, as she stood across from the cat, fore-paws in the water. She balanced her weight on her left side to avoid opening her wound she gained a week ago, as she faced the clan cat. "I apologize. I didn't know this area was claimed." She mewed and gazed at the cat. "I just needed to get away from the forestry." She glanced back at the distant tree tops as her ears flattened against her head. Minkstar's green gaze lowered a bit before she glanced towards the distant tree tops as well. "Hmmmmm," she exclaimed before she paused and leaped into the water, holding her breath before she re-surfaced near the other side. She shook her now glossy wet pelt and looked at the she-cat, her green gaze falling upon her wound. "I see you have been injured recently......come with me and I'll help you to cross. This land belongs to RiverClan, the rain we'd had had weakened our scent posts on our borders which is probably the reason why you didn't know this land was claimed. I am Minkstar, leader of RiverClan." she explained to the she-cat as well as introducing herself. She shook her pelt again to rid of some of the moisture as she waited for the she-cat's response. Frost watched her resurface and shake her pelt. She glanced down at her wound and meet Minkstar eyes. "Er, I'm Frost." She mewed and lowered her head in respect before raising it. "The wound was received only a few weeks ago, I'm sure I can cross without much aid. But thanks." The white she-cat smiled. "I've heard tales about the clans in these woods but I never thought I'd come across one." She admitted. Minkstar purred once with amusement. Her whiskers twitched as the she-cat stated that she didn't need her help. The RiverClan leader tilted her head to the side and flicked her tail once. 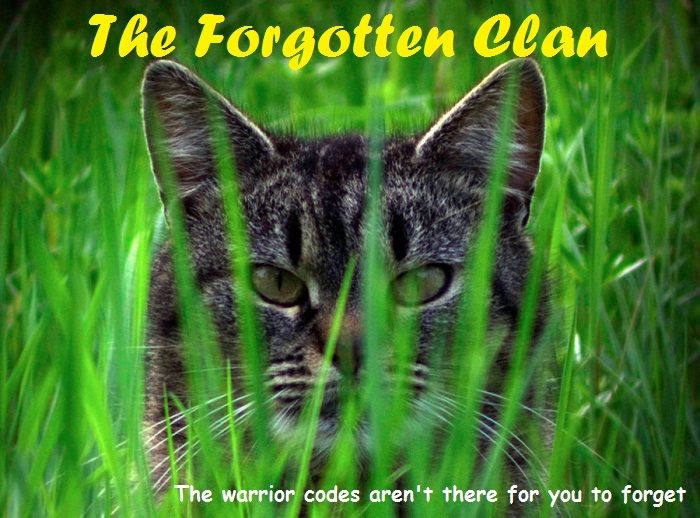 "Well, if you need a place to stay, you're welcome to become a clan cat like me," she paused scratching behind her ear before shaking her head, "I'd help teach you our ways and introduce you to the rules all clan cats even I follow, but if you'd decide to see how the other clans are like then I won't judge you." she finished before she slowly entered the stream again, the water coming up to her chest before she glanced back at her, green eyes gleaming. Frost smiled lightly as Minkstar looked back at her with bright green eyes. Her red eyes shined brightly,hearing as she was invited. She padded into the water and swam after Minkstar. "I'll gladly become a cat of Riverclan." She smiled as the water washed over her dried pelt, making it wet again. Water lapped against her body as she came close to Minkstar. "So what exactly is Riverclan?" Minkstar looked at Frost, her green eyes twinkling as she listened to the she-cat's response. She smiled gently as Frost finished and asked her a question. "Well, RiverClan is one of the four Clans that roam the forests and plains. RiverClan mainly roams the area where most of the water and streams are, and as a result of that, we do not fear the water as most cats from the other Clans do. We eat mainly fish we catch from the stream and warriors of my Clan are strong and loyal." she explained and answered the she-cat's question before she continued to cross the stream. With her paws stroking strongly against the slight current, she soon reached the stream's other bank. She shook off her pelt once more before she flicked her tail and waited for Frost to catch up with her. Frost fought against the weak current with little strength before reaching the shore line. She padded into the mud and shook her pelt. Water droplets flew as she rapidly shook her fur. She looked at Minkstar with a slight smile. "So you guys swim then? Well that could work for me. Who are the other clans?" She peered at Minkstars side. Minkstar flicked her tail as the white she-cat reached her side. "Well, other than the RiverClan, there are 3 Clans. One is called WindClan, they roam the moors and plains and mainly are known for their speed and hunting rabbits. Another is called ShadowClan, they roam the land closest to the mountainous lands where carrion place stands, they are usually dark and unpredictable and they usually hunt rats. And finally, there's ThunderClan, they roam the forest land on one of our borders, and they are clever and peaceful, and they hunt anything from birds to voles." she explained in the best details she could muster. Frost let out a slight purr. "Well, then I traveled the right way." She smiled and looked around at the few surrounding trees then to the forest in the distance. "Please do tell me more." I asked and turned away from the woods. I will return to face those two again. But I won't be alone the next time we meet. Minkstar chuckled in response. "I'll explain more once we're back at camp." she told the she-cat, smiling gently. I do want to tell her more but if I tell her she'll be confused by the time we get back to camp! she thought in her head. "I would tell you more, but I'm afraid you'd get too confused by it. It's a bit too much information to learn in one encounter." she explained softly to Frost.